Hey there! Good to be back after a long hiatus! There’s snow on the ground in New England where I am, but the calendar says there’s still 5 days of fall left. This recipe has some great fall ingredients in it, but really it’s just a good comfort dish to enjoy all winter, too. I used an organic chicken sausage with roasted apples in it, but you could use any variety you choose. The toasted pecans are really the MVP here, however. They really just kick up and round out the dish. 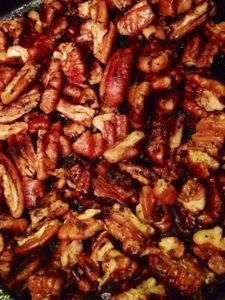 Toast the pecans in a dry, hot sauté pan for about 3-5 minutes, shaking the pan frequently to prevent burning. When the nuts are about done, add 1 tsp butter, 1/4 tsp cinnamon, and 1/8 tsp nutmeg, stirring to combine. Remove the nuts from the pan and set aside. In a large pan with 1 tsp of olive oil and 1 tsp butter combined, cook the sausages, letting them brown evenly. 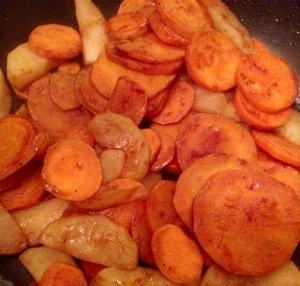 As the sausages cook, peel the yams and slice into rings about 1/8″ thick. Peel and core the apples, slicing them about 1/4″ thick. When the sausages are heated through, remove them from the pan and keep them warm in a low oven. Add another tsp of butter to the same pan, then add the yams and sprinkle with cinnamon. Sauté for about 5 minutes, covered, stirring frequently. Add the apples, some more cinnamon, some ground nutmeg, and the brown sugar or honey. Continue to sauté in the same manner for another 15 minutes or so, testing the yams for doneness often. 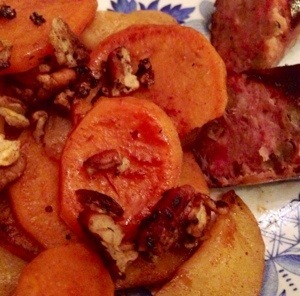 Plate the yam-apple mixture with one of the sausages, topping the dish with a portion of the toasted pecans. For pairings, if you like hard cider, that would be a good match. For wines, go with a semi-sweet Riesling, a Gewurztraminer, or a great wine that’s local to me, but growing in popularity – Ballet of Angels by Sharpe Hill. The yam-apple mixture could work as a side dish with pork chops, pork tenderloin, or even chicken, too. Either way you serve it – enjoy! 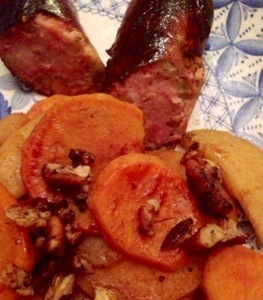 This entry was posted in Dinner, Fruit, Side dishes, Vegetables and tagged Apple, Ballet of Angels, chicken sausage, Cinnamon, Gewurztraminer, hard cider, New England, nutmeg, pairing, paleo, pecans, Riesling, Sausage, Sharpe Hill, sweet potato, Yam. Bookmark the permalink.